The female Fourstardave. Dave’s Pal. Tough and dependable. So was Irish Linnet described during her six-year racing career, a career that saw her win at Saratoga for six consecutive years, including five straight wins in the Yaddo. She won her first race at Saratoga as a two-year-old in 1990. It was the third start of her career, and her first win. Nobody who watched her that July day could possibly have considered that she would go on to do what no filly or mare had done before, or has done since. Trained by Leo O’Brien, Irish Linnet was three years behind her famous stablemate. Like her, Fourstardave had won at Saratoga in his third start; that was in 1987, and it was a stakes race. She had a little catching up to do: it took her until her second season at Saratoga, in 1991, to win her first Saratoga stakes race, and it happened in the Yaddo, on August 23. Fourstardave famously won a race at Saratoga for eight consecutive years, 1987 – 1994. Irish Linnet began her streak three years later and carried it on for one more year, winning at Saratoga from 1990 – 1995. Both horses were retired after that year; it was the first time in his nine-year career that Fourstardave didn’t win at the Spa. Irish Linnet was owned and bred by Austin Delaney, an Irish immigrant who was a New York restaurant owner; she was out of the Irish-bred mare Royal Slip and by Seattle Song. Delaney also bred Irish Actress, also by Seattle Song and out of Dianette. Both horses were trained by Leo O’Brien, and in 1991, the 3-year-old Irish Linnet won one division of the Yaddo; the 4-year-old Irish Actress won the other. And Irish Linnet just got better as she got older. At six, she won the Yaddo and the Grade 3 Noble Damsel (being run at Belmont this Sunday); at seven, she got her fifth Yaddo win and second in the Noble Damsel, and she added the Grade 2 New York Handicap – her first Grade 2 win. In a 1994 article in the Albany Times Union, trainer Leo O’Brien called Irish Linnet “the new Fourstardave” in talking about his two Saratoga-lovers, whose streaks were both going strong at that time. With two “Horses for Courses,” O’Brien is really enjoying himself at Saratoga. The article also notes that Irish Linnet broke her own record in the race that year, running the mile in 1:46.2. She set the Yaddo record of 1:47.0 in 1992 and tied it in 1993. “This is important because it will be a long, long time before any filly could win this race five straight years…I’m proud of her because she started this when she was a 3-year-old, and that’s not an easy thing to do. Irish Linnet didn’t go on to race at eight; she was retired later that year, after winning the Noble Damsel in September and the Ticonderoga in October. In her final six starts, her record was 4-1-1. Her lifetime record? 62 starts, 19 – 16 – 10, earnings of $1,220,180. She’s been bred to some big-name stallions, Giant’s Causeway, and Saint Ballado among them; her most successful foal was her first, Blushing Irish (Rahy), with earnings of $133,136 from three wins in 19 starts. Her 2008 Artie Schiller colt, Irish Art, made his first three starts this summer, breaking his maiden in his third try, on September 2 at Del Mar. Her 2009 bay colt by Spring At Last is hip 2691 in the current Keeneland sale, and according to John Stuart of Bluegrass Thoroughbred Services, Irish Linnet is now retired. “A wonderful, big mare,” he called her. In addition to living on through her offspring, the 23-year-old Irish Linnet also lived on this year in not one but two stakes races on the NYRA circuit, one at Belmont in April, one in July at Saratoga. And in the tradition of the mare who like to win the same race more than once, both 2011 Irish Linnets were won by John Terranova’s Chorus Music, news that made it across the Atlantic to Irish Central (who doesn’t quite get the family connection between Irish Linnet and Irish Actress). While Irish Linnet regularly got her picture taken for wins in other races, there was something uncanny about her ability to win the Yaddo. No other filly or mare is thought to have won the same race five years in a row; only one male, Kelso, did it, winning the Jockey Club Gold Cup from 1960 to 1964. Though she was named for Ireland, Irish Linnet was a New Yorker through and through: a New York-bred horse who made her mark in a New York-bred race, doing in New York what no filly or mare will do again. Photo credit to Bob Coglianese, with many thanks to NYRA for providing these two shots of Irish Linnet. Please don’t re-post them without their permission. Arcenault, Bill. “Dave’s Pal Keeps Pace At the Spa; Irish Linnet Captures 4th Consecutive Yaddo.” Albany Times Union, August 18, 1994. Accessed via New York State Newspapers database. Finley, Bill. “Irish Linnet Aging Well,” New York Daily News, July 10, 1995. Finley, Bill. “Linnet wins 5th Yaddo,” New York Daily News, August 17, 1995. O’Shea, Sean. “Chorus Music stakes victory keeps great Irish horse racing tradition alive at Saratoga.” Irish Central, July 25, 2011. One of my all-time favorites… 🙂 Such a nice surprise to see an article about her – and, as usual, it’s a thoroughly researched, wonderful article. Thank you! Of course, anyone at the track during those days will remember her and the O’Brien stable (we also love Irish Actress). I photographed Irish Linnet at the sales last time around. They brought her out to pose – John Stuart is sure right in that she’s a big mare, and wonderful. She was a bit over at the knees by that time, but her eyes were so sparkly and proud. She deserves the memories and the praise. Thanks again! A beautiful tribute to a mare who was (and is) lovely in every way. Thanks for including me in this celebration. He’s a lot more unique than are either of those, considering his SEVEN consecutive (and eight overall) wins in the same stakes. Perhaps even more remarkable are his TEN consecutive starts in the same stakes race. It is so great to hear from people who know this horse…Barbara and Rob, thank you so much for reading, and for your comments. Linda, photos to come this weekend. Horatio: had never heard of Leaping Plum, but a quick look at his PPs sure reveals a high level of impressive. Thanks for bringing him to my attention. Instead of having two different overnight stakes for her (as it seems NYRA sometimes haphazardly uses the same name for more than one overnight stakes event), why not add a new $100,000 regular stake for her early in the Saratoga meet (perhaps on opening weekend for fillies and mares at a mile on the turf, moving the Grade 1 Diana back to closing day where it has been contested in the past and finding another spot during the meet for the Grade 3 Glens Falls). That to me would make more sense. How did I overlook Rob Whiteley’s comment in the article above? Shame on me…it’s beautiful, and it reflects Rob wonderfully. Rob Whiteley is one of the country’s most precious resources – in my opinion, the most precious – protecting and valuing these older mares. A gem beyond words…. Definitely OK to post links…(well, except for the inappropriate ones…), so thanks for this…cool! What I was proposing was to me a better way to honor Irish Linnet, and do it just like Fourstardave, by giving Irish Linnet an open stake for females on the turf at a mile, which actually would give NYRA a second stake during the Saratoga meet for Grade 2-3ish older female grass milers (what I would be doing with the Diana would be to move that back to closing weekend and also lengthen that race to 1 3/16 Miles on the turf, while as noted the Glens Falls would find a spot earlier in the meet at Saratoga, possibly lengthened to 1 1/2 or even 1 5/8 Miles). Such would all be part of a major overhaul of the NYRA stakes schedule that potentially would see the Sword Dancer moved to April at Aqueduct as the first big money race for older horses going long (and first turf stake overall) of the year in New York (while staying at 1 1/2 Miles), getting that race away from the Arlington Million and moving the Fourstardave (with a purse increase to at least $250,000) to the spot currently occupied by the Sword Dancer and shortened to a mile (possibly becoming a “Win and You’re In” to the BC Mile and the Bernard Baruch possibly also shortened to a mile and run on closing weekend) while the Man o’War is moved from the summer meet to closing weekend at Saratoga and the Bowling Green at Belmont returns to the spring meet there in the Man o’War’s current spot. Races at seven and a half furlongs and 1 3/8 Miles on the main track. Races at six furlongs and 1 1/4 Miles on the Mellon Turf course. Races at five and a half furlongs and 1 3/16 Miles on the inner turf course. The first two additional options around one turn are the main reasons I would seriously be looking at adding a second finish line at Saratoga, with being able to have races at a mile and a quarter on the turf an added bonus (that I would be looking to do with the Diana if such a finish line were added). 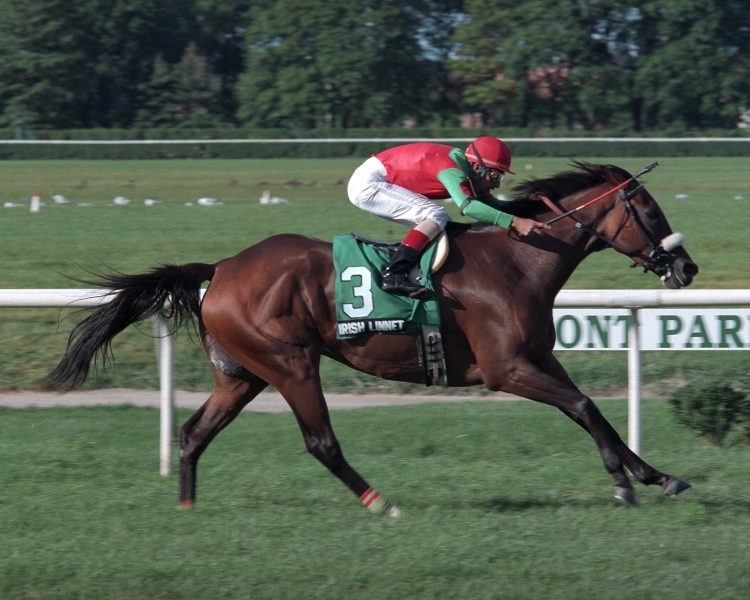 Like most fans of NY racing, I have very fond memories of Irish Linnet; thank you for rekindling them. But my favorite time watching her was when Leo took a shot running her in the Irish 1,000 Guineas at The Curragh, a week after he won the male version of the race with Fourstars AllStar. She was prominent for awhile before fading. I just took a look and realize the winner was Kooyonga, who later won a G1 Stake at 4, and 2nd was Julie La Rousse, who won several stakes at GP the next year and dropped Mariensky and Rousing Victory. I was forced to gallop her after a hard night out when her exercise rider didn’t show up. I’ll never forget it, “Me? Gallop her? Great, there goes her Yaddo streak.” But we got along, she was stern and opinionated but always a lady. You knew you were a simply a guest. Mark, thanks. Wonder if the video that race is out there anywhere? May have to engage in some serious procrastination to see. What a great comment, Sean…she seems to have cast a spell on many of the men who encountered her.